I added a 16th term to the Venn Diagram and new handout to go with it. 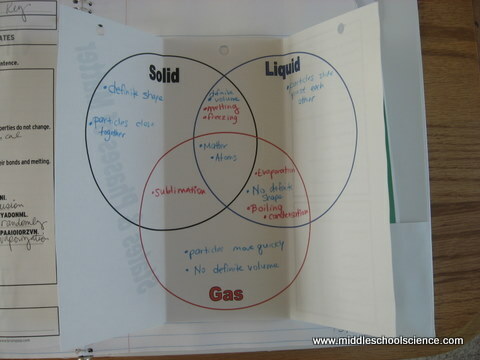 Discuss what we know about Solids, Liquids, and Gases. Give each student one of the 16 facts. They are not to share their facts with the class until it was their turn to present. After a minute or so to think about it, ask the person with Fact #1 to stand and read their fact to the class. The rest of class will think about the fact and where it might go into the Venn Diagram, but not share their answers. The person with Fact #1 will guess where the fact fit into the Venn Diagram. Once they give the correct answer, click on the Google Slide and the answer will pop up on the screen. Everyone will write fact #1 into their notes. Using a blue colored pen or pencil, the students will fill in the phrases related to the states of matter and their characteristics, such as definite shape or volume. Using a red colored pen or pencil, they can write in the phase changes, such as evaporation. They will notice that all of the phase changes are placed where two states of matter overlap. For example, evaporation is placed where liquids and gases overlap. Then ask the person with Fact #2 to read their fact to the class, and so on until all 15 facts are posted. Instead of each student having only one fact, you can have the class work in cooperative groups and give one set of the 16 facts to a group of 4 students. The students will discuss/share their facts within their group and come to an agreement on where it should go. They will place the facts on top of the Venn Diagram where they think it is the best fit. Once each group has had a chance to discuss their facts, you can go over the answers as a class. Starting with #1, have the first group tell the class where they think it belongs in the Venn diagram and why. If their answer is correct, show the answer in the Venn diagram and have each student write that fact into their notes. Optional: Using a blue colored pen or pencil, the students will fill in the phrases related to the states of matter and their characteristics, such as definite shape or volume. Using a red colored pen or pencil, they can write in the phase changes, such as evaporation. They will notice that all of the phase changes are placed where two states of matter overlap.For example, evaporation is placed where liquids and gases overlap. If it in incorrect, go to the next group and have them share where they think it belongs. Ask the next group for fact #2, and repeat the steps above until all 16 facts have been placed into the Venn diagram and each group has had a chance to place a fact into the Venn Diagram. This is an interactive/SmartBoard activity to show the relationship between the phases of matter and phase change. Part 1 – Discussion and Categorizing: Students will work in collaborative groups to determine where each statement will go into the Venn diagram. In their notes, they will pencil in an ‘S’ for solid, ‘L’ for liquid, ‘SL’ if it goes between Solid/Liquid, etc… next to each statement on their list. Part 2 – SMART Board: Each group will have a turn to make a guess to place one of the statements into the Venn diagram. If the group is correct, it stays in the Venn diagram and each student writes the statement into their Venn diagram handout and crosses it off the list. If the statement is incorrectly placed into the diagram, the statement is returned to the list outside of the diagram. The next group chooses a statement, and so on, until all of the statements have been placed correctly into the Venn diagram. Using a blue colored pencil, the students will fill in the phrases related to the states of matter and their characteristics, such as definite shape or volume. Using a red colored pencil, they can write in the phase changes, such as evaporation. They will notice that all of the phase changes are placed where two states of matter overlap. For example, evaporation is placed where liquids and gases overlap. This looks great, I am excited to use as a review activity with my 7th graders! Thanks for sharing. Updated version included Google Slides and additional suggested activities.